Lavie is traveling with Keel and Blue while searching for her master Siva. 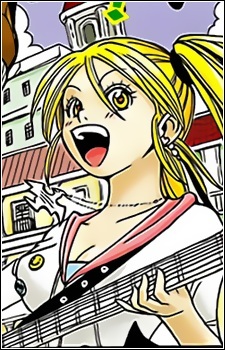 She is a monster user that can control monsters via her mystical guitar and can enhance monster's fighting capabilities. Lavie has blond hair. She has a very energetic personality, she is usually cheerful and cares for her friends deeply. She tends to become stronger, so she can help Keel and Blue. She is always accompanied by Mippy.